Like most people with disabilities, I did not start out as an advocate. My father and mother were my first advocates. My parents’ advocacy began when I was eight months old in 1947 when a doctor at Children’s Memorial Hospital in Omaha told them that I would not live beyond the age of one year and that they should take me home and make me comfortable. Then, he concluded, “You’re young enough to have another,” as though one baby is just like any another and can easily be replaced. Well, mom and dad took me home alright, but they didn’t just make me comfortable, they reared me as an ordinary child and made sure I went to a regular public school, wheelchair and all, at a time when mainstreaming was not on anyone’s radar. They never once considered placing me in an institution for “Crippled Children,” to the chagrin of some local busybodies who thought that was the right thing to do! See, mom and dad had a more than adequate level of bullheadedness which, it seems, I’ve inherited. I finally became my own advocate when, after graduating from Kearney State College as a fully credentialed high school teacher in the areas of Physics and Mathematics, I was discriminated against on the basis of my disability. So, I was unsuccessful in my efforts to be hired as a full-time teacher, mostly because the ADA had not yet been written. I was my own advocate again, along with my attorney, when I had to take the Nebraska Department of Health and Human Services to District Court where I was successful in preventing them from denying me 24 hour care in my own home. Finally, in 1995, I and many other advocates, including the private sector, members of the Nebraska Unicameral, and even those within state government were able to amend the Nurse Practice Act which allowed persons with severe disabilities to direct their own care in their own homes through care aides who did not need to be medical professionals, but would still be paid by the state to take care of such persons while performing invasive or specialized procedures, approved by an RN or a medical doctor to be deemed safe. The point of all this is that we all need to be advocates, not only for ourselves but for others, especially those who are new to disabilities and who often have no idea how to speak up for themselves or locate resources they need for daily living. Advocacy is essentially an act of educating oneself and others, not only about their rights under the law, but also to exercise our right to petition the powers that be for the things we need for survival and the opportunity to thrive in the community. If you’ve ever thought about becoming an advocate, don’t just think about it, DO IT! Tim Kolb is the CEO and Executive Director of the Kolb Foundation for Disability Education (KFDE) in Franklin, Nebraska. Currently, Tim also serves as the President of the Board of Directors at Independence Rising, the Center for Independent Living of Central Nebraska in Grand Island, is a member of the Community Advisory Board (CAB) of the Monroe-Meyer Institute in Omaha, and is a member of the Nebraska Consortium for Citizens with Disabilities (NCCD). 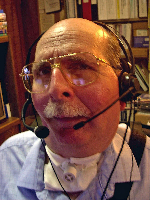 Over the years, Tim has served in a number of disability based organizations in the state including the Nebraska Statewide Independent Living Council (NESILC), the Association of Community Professionals (ACP), the State Rehabilitation Council (SRC), Nebraska Advocacy Services (now called Disability Rights Nebraska), and the Assistive Technology Partnership’s Advisory Council.